260. 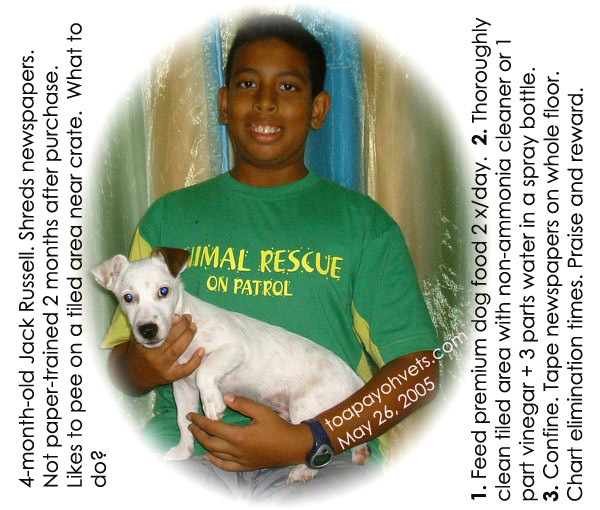 May 26, 2005. Newspapers can also be taped on the pee-tray below the cage to encourage paper-training of this puppy. 259. May 21, 2005. 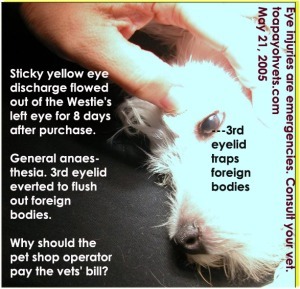 Sticky yellow eye discharge for 8 days. The Westie could have rubbed itself blind. 258. May 19, 2005. The hamster lives longer since it is no longer stressed and irritated by the "infected navel" which is his scent gland with waxy secretions. 257. May 19, 2005. 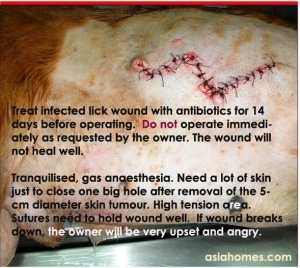 The owner thought the infected navel lump was a tumour and wanted it removed. 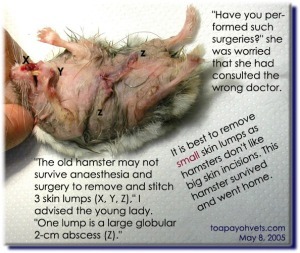 She had 2 hamsters with the same medical condition. 256. May 14, 2005. 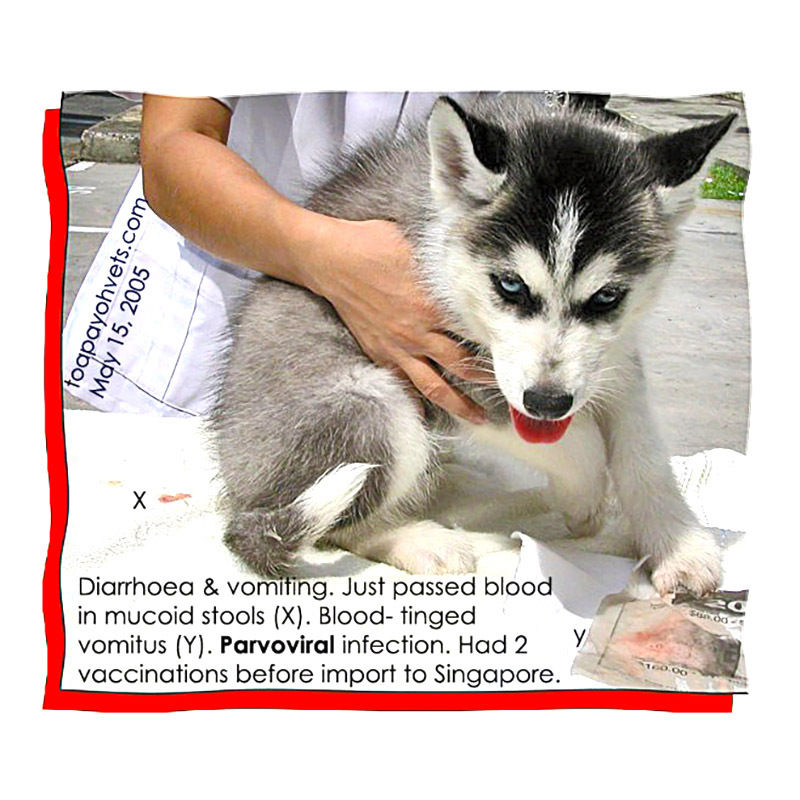 A Siberian Husky puppy squirted bloody diarrhoea and had vomited blood-tinged. 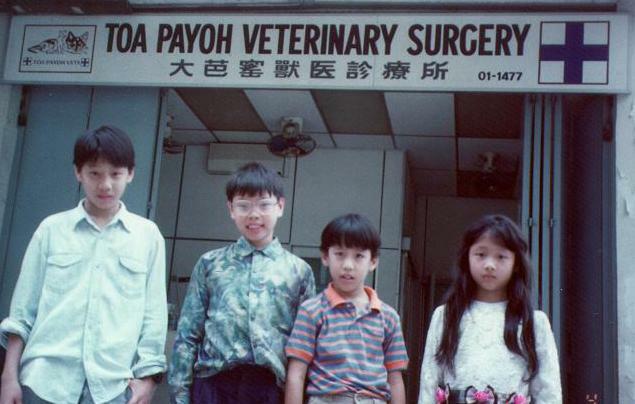 Tested positive for parvoviral infection. 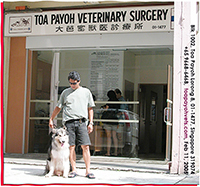 Should pet shop operators save money by not vaccinating imported puppies on arrival? 255. May 15, 2005. 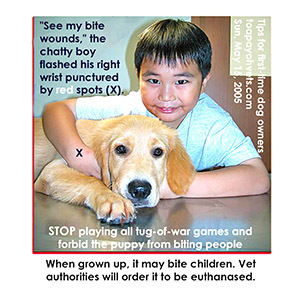 Big dogs can be dangerous biters if they are encouraged to bite children when they are young. 254. May 19, 2005. Milk seen at lips. The cause was a defect of 2-mm in the soft palate. Puppies thrive and may live longer than if there is a cleft in the hard palate. Milk coming out from the nostrils 253. May 12, 2005. 3 large Shih Tzu pups suckled a lot but dam is thin. 1 pup had died (swollen bruised eye) earlier. Dam would not eat dry dog food now but had 2 eggs earlier. 252. May 12, 2005. 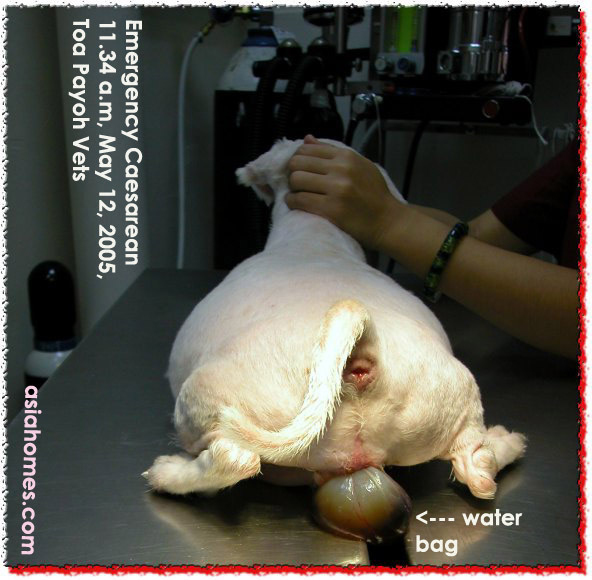 Emergency Caesarean. 2 other large Maltese pups vigorous too. Mother not distressed. 251. May 12, 2005. Very close monitoring of dam. Rushed to vet within 60 min. 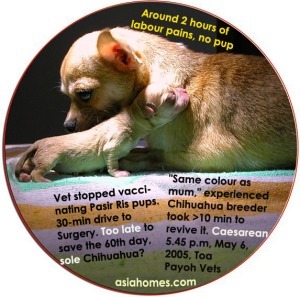 Pup stuck in birth canal saved. 250. May 9, 2005. Early detection of light green vaginal discharge. 1/3 Shih Tzu pups (right) very weak. 249. May 9, 2005. Chihuahua pups are more sensitive to Caesarean delays if there is dystocia. 248. May 8, 2005. 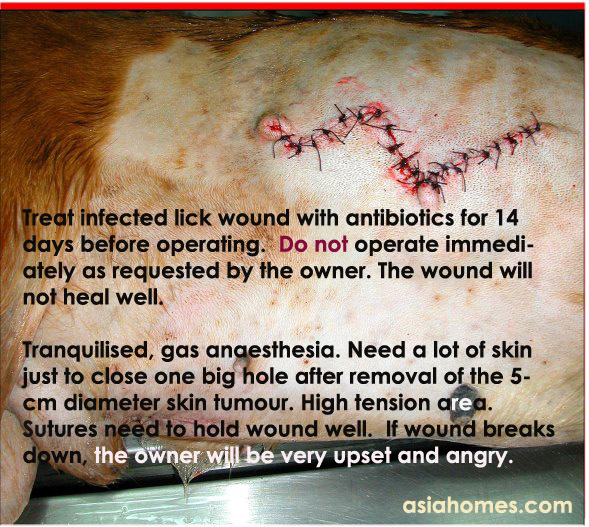 Some owners misconstrued advices on anaesthetic risks as incompetence. 247. May 8, 2005. 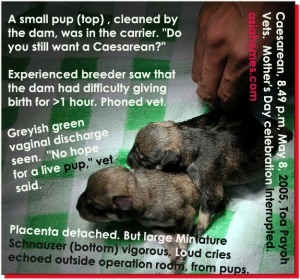 Placenta just separated. If breeder misjudged, no Caesarean, large pup would be dead. 246. May 6, 2005. 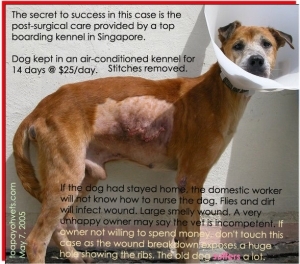 The air-conditioned kennel and excellent post-nursing care is paramount in this case. 245. May 6, 2005. A high tension area. If the wound breakdown, the ribs will show. 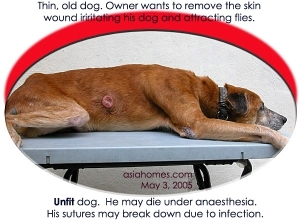 Owner will be angry. 244. May 6, 2005. 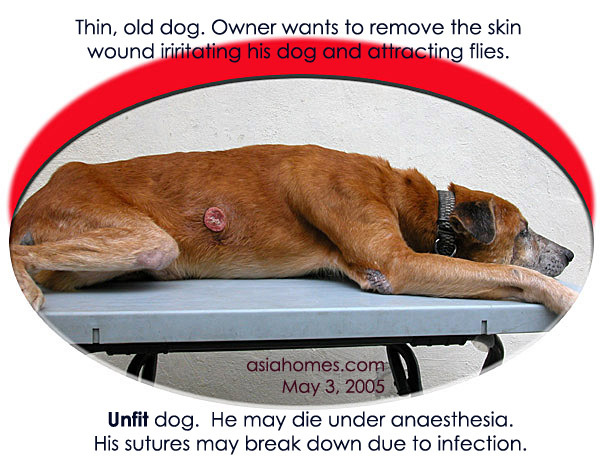 An old and thin dog is a high anaesthetic risk. To operate or not? 243. May 6, 2005. 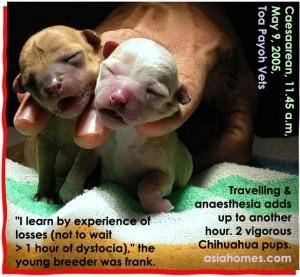 Chihuahua pups die if there are delays > 2 hours to commence Caesarean delivery. 242. May 6, 2005. 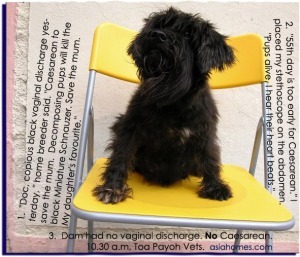 Black discharge was stools passed out suddenly yesterday. 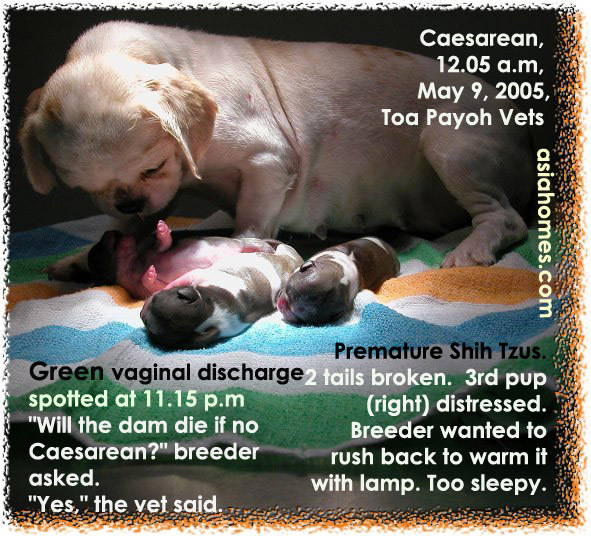 No Caesarean. Gave birth to one pup naturally. 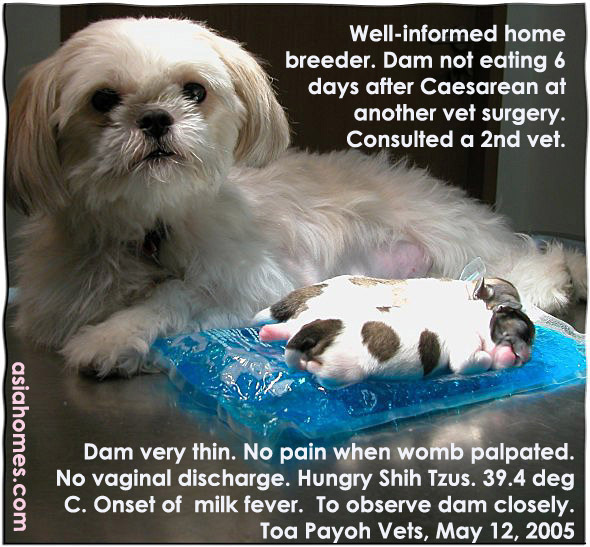 Pup killed by fight between this dam and a Golden Retriever dam in the same residence. Can you take less than 2 minutes to make this puzzle?